A bread that requires no yeast? Shoot, let’s give it a go. Soda bread gets the name because it uses baking soda instead of yeast. It’s essentially a “quick” bread since there is no waiting around for the yeast to proof and the bread to rise, and there is only a few seconds of kneading involved. For baking soda to “work,” a recipe needs to include an acidic ingredient like buttermilk. Tangy, delicious buttermilk, of which I had plenty. The bread contains a mix of oat flour and all purpose flour. I like how the oat flour adds some whole grain protein and fiber to the bread. The oats help me justify slicing my bread into thick slices. Making oat flour is super easy and just involves pulsing oats in a blender or food processor until they look like a powdery flour. I often use oat flour in cakes, muffins, and cookies, too. Lately I find something so satisfying about making a well in the center of dry ingredients and adding in a liquid. The dough starts off a little shaggy but eventually comes together. On a well-floured counter, the dough gets kneaded. Knead and turn, knead and rotate. That’s my mantra. Knead with the heel of the hand (for pie crusts, knead with the side of the hand), rotate the dough, and knead again. It probably took me 10 to 15 kneads and turns to get the dough into a nice cohesive ball. Into a parchment lined loaf pan. A little brush of buttermilk on top and a big sprinkle of seeds. 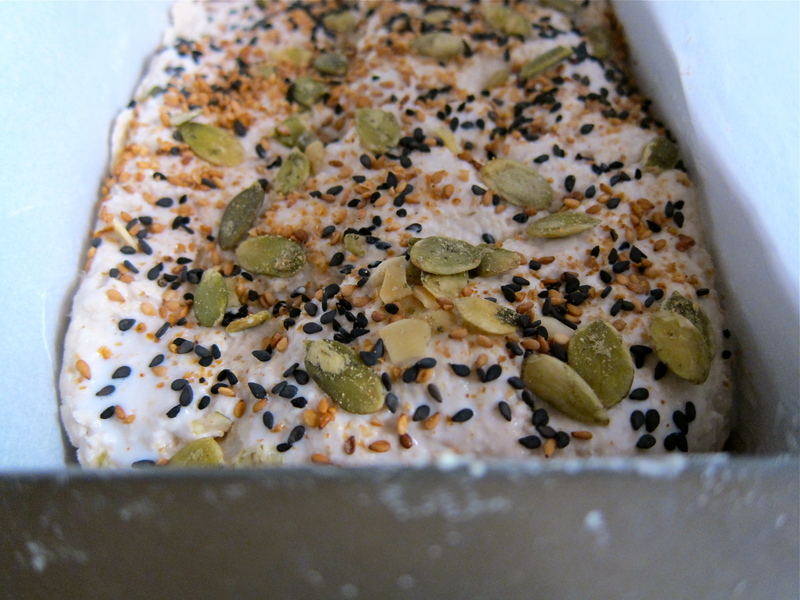 I used nigella seeds, black sesame seeds, crushed and toasted white sesame seeds, and pumpkin seeds. Don’t like seeds? Just dust a little extra flour on top. After a long week, the idea of sleeping in on a Saturday morning and making bread that I could eat hot out of the oven sounded sooo good. Do note that the bread takes about an hour to bake, during which I sipped coffee and milled around in my sweats. The hardest part is waiting for the bread to cool slightly. Since I have no self-control when I find myself face to face with a hot homemade loaf, I cut into the bread when it was still too hot, and got slightly crumbly slices in return. Delicious, warm crumbly slices (if you’re not into that, note that the bread cuts nicely once fully cooled). Since I am terrible at making decisions, I had one slice with butter and one slice with avocado. The best of both worlds. The bread toasts up nicely, too, if you’re into toast. Anyone for a midnight snack of almond butter and honey on buttermilk oat soda bread? Store leftover bread in a Ziplock bag. It will keep for a few days on the counter. 1. Preheat the oven to 400 degrees F. Line a loaf pan with parchment paper, leaving some overhang on the sides to easily pull the finished bread out of the pan (optional: butter or spray the pan before lining it to help the parchment stick). 2. In a blender or food processor, pulse the oats until they resemble a powdery oat flour. Combine the oat flour with the all-purpose flour, baking soda, and salt. Whisk together. 3. Make a well in the center of the flour and pour in the buttermilk. Stir just until everything comes together into a dough. Turn out onto a lightly floured countertop and knead for 30 seconds or so, just long enough for the dough to come together into a cohesive, slightly flattened ball. If the dough is on the dry side, add more buttermilk a small splash at a time. If it is on the wet side, knead in a little more flour. 4. Ease the dough ball evenly into the prepared baking pan. Brush the top with buttermilk and sprinkle generously with mixed seeds or extra flour, 2 tablespoons or so. 5. Bake for about 30 minutes, then quickly (so as not to let too much hot air escape the oven) move the rack and the bread up a level, so the top of the bread gets nice and toasted. Bake for another 20 minutes, or until a hard crust forms and the bread is baked through. Take the bread out of the pan and let it cool on a wire rack. Enjoy fresh or toasted! 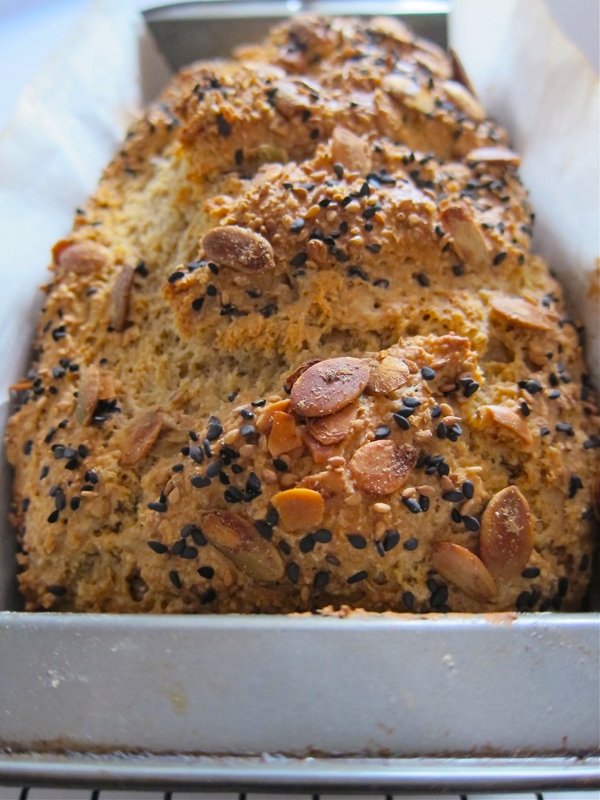 This looks like a delicious soda bread… thanks for sharing! Thanks, Jenn. Let me know if you make it!